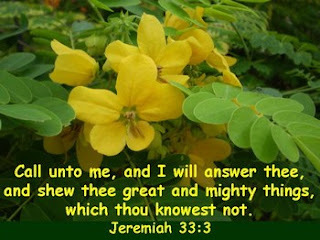 ♥ Thank God for His many goodness and mercies to me especially in answering many prayers in His wonderful ways. ♥ I am thankful to God for seeing me through a few very busy and tiring weeks. Thank God that though I am weak, He is strong. I can rest in Him daily and experience His sufficient grace. ♥ I am thankful to God for blessing my time with some sick and elderly people in my church when I visited them recently. It is always a joy to visit God's people and share God's love and kindness with them. Though I went with the intention to encourage them, many time our Lord used them to encourage me. Their simple faith and trust in Him despite their various afflictions always encouraged me in my own walk with the Lord. It is a comfort to remember that God is with us through all the changing scenes in life, and His grace is sufficient for us. ♥ I am thankful to God for providing my family, church brethren and blogging friends who continue to care and encourage me in many ways. Thanks for your encouragement. Take care and have a blessed day! I love you dear friend, praying for your wellbeing. I love you too, Denise. Thanks for stopping by and your continuing prayers. I am keeping you in my prayers too. Take care and God bless you! Thanking God for getting you through some busy, tiring weeks really hit home with me. I had a very stressful August and I forgot to thank God for His strength in helping me through it. Thank you for sharing your grateful heart with us today and what beautiful bookmarks. Have a blessed day! It is so good to find your blog and to hear your testimony and to learn more about Singapore! God bless you. Thank you so much for your blessings when you commented on my TT post. You are so sweet. Blessings back at you! Saw your blog title on another blog and just had to come over. I knew that with such a title you were a person of faith. Nice to meet you Nancy. Must read more of your blog. I know from experience that it is in the dark valleys that we learn most from our Saviour and grow in a way we cannot on the mountain tops. Also we know the joy of the mountain tops much moe acutely when we have experienced the valleys. Blessings to you. Nancie, I have been gone for several months but I am now back reading and posting. I am glad to see that you continue to be filled with the Spirit of God and sharing your sincere blessings. Hi Hip Chick. Thank God for giving your strength through the stressful August. May He continue to grant you much grace and strength daily. Take care and have a blessed day! Hi Laurie. Thanks for hosting Thankful Thursday. May you have a blessed day too! Thanks, Karen, for stopping by. And welcome to my blog! Glad you can get to know Singapore. God bless you too! Thanks, Becky, for your sweet comment. It's always a joy to hear from you. May you have a blessed weekend! Thanks, Barbara, for visiting my blog and your kind comments. It is a pleasure to know you. I had a quick look at your blog. I love the pictures you posted there. So beautiful! It is so true that it is in the dark valleys that we learn most from our Saviour and grow most, and we know the joy of the mountain tops much more acutely. May God continue to bless and guide you as you live for Him. Blessings to you too! Annie, welcome back! It's so good to hear from you. I am glad you are back to posting and reading. I have not been able to post and read blogs regularly but have missed you so. Keeping you in my prayers. Take care and keep in touch! Hi Nancie...just stopped by to say hello! I enjoyed reading your posts and looking at your beautiful photos! Great blessings - it's so much fun to host giveaways and bless others! Thanks, Susan, for stopping by my blog. Thanks for your encouragements. I am glad you enjoyed my post and photos. Do come by whenever you can :) Take care and may God bless you abundantly! Thanks, Rita, for stopping by. It is indeed very fun to host giveaways! Hope you get to join them. Take care and God bless! Hi Nancy, hope you're doing better now. The bookmarks are so pretty! Beautiful list, Nancie! Thanks for your visit to my place. I used to be a regular visitor here and I guess somewhere along the way I lost your link. So happy to have found you again! Hi LS and Happy, thanks for stopping by! Hope you have a blessed week too. Welcome back to my blog, Shelby! Glad to be in touch with you again. Take care and have a blessed week! Thanks, Carla, for stopping by. Glad you love this verse :) Take care and have a blessed day!